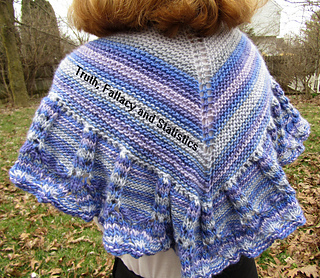 There are so many fallacies about knitting, especially knitting shawls! Only gray haired old ladies knit shawls…Fallacy. 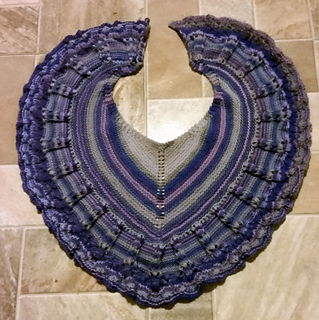 Anyone can knit shawls…Truth. 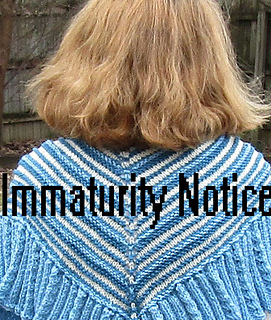 You can’t use self striping yarns to make shawls…Fallacy. 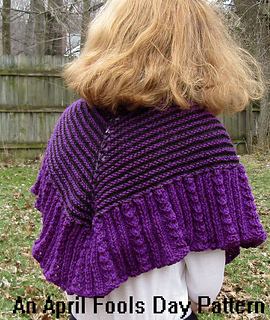 Any yarn can be used to make shawls…Truth. 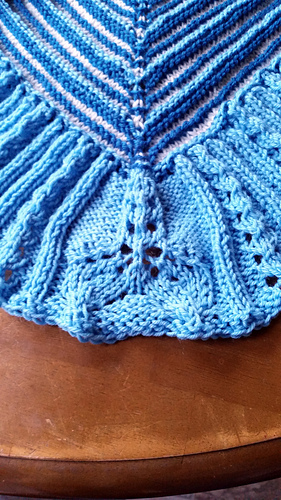 The lace on this shawl represents the Eiffel Tower…well….that would be a “Phallus-y”. Pick one, two, or three colors, a body style and a border for a Choose Your Own Adventure Shawl. Body instructions are written only, borders have both charts and line by line written instructions. 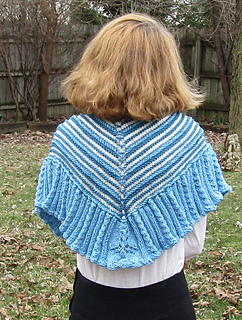 Three variations of a garter stitch, winged triangle body lead you to a choice of three variations of the border. 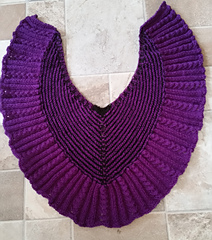 All three variations that I knit were in worsted weight yarns, so the knitting goes quickly and each takes approximately 460 yards. You can decide to work it in one, two or three colors. 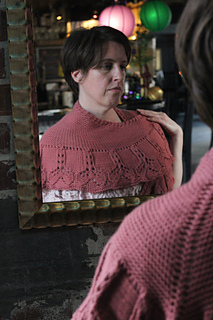 The plain garter stitch body is shown paired with the Fallacy border which has 23 motifs. A two color slip and slide garter stitch body is paired with the Truth border, which has no motifs. A three color slip and slide garter/stocking stitch is paired with the Statistics border, which has three motifs. All three body styles will flow into all three border styles. Thank you to everyone in the Indie Gift Along After Party group for ensuring, by challenging me to design this, that my inner 13 year old had a good laugh!